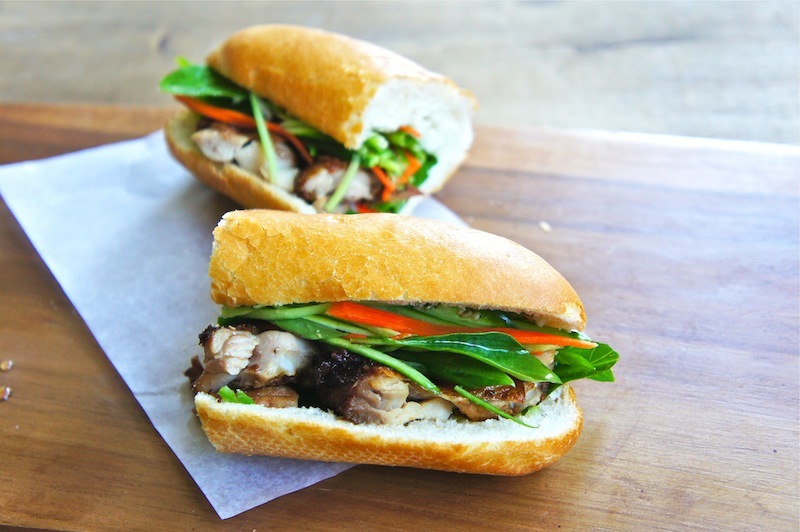 I'm currently hooked on this Spicy Lemongrass Chicken Banh Mi. I have already made them twice this week, kids love it as well. It's really that good. The slightly toasted Vietnamese-style baguette is filled with aromatic chicken, pickled cucumber and carrot, plenty of fresh herbs, such as Asian basil, coriander, and Ngo Gai. 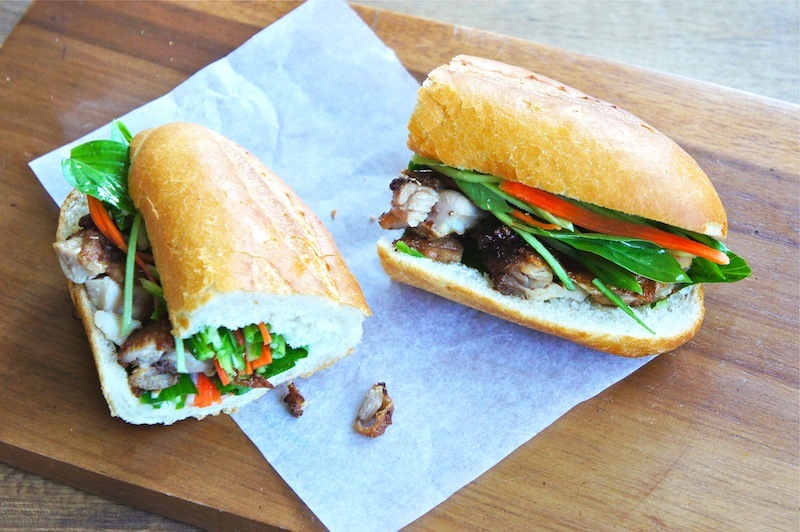 Do have a go at this Vietnamese inspired sandwich recipe and tell me what you think. Pickled Cucumber & Carrot: Mix the rice vinegar, sugar, and sea salt in a small saucepan. Bring the mixture to the boil until the sugar dissolved and let cool to room temperature. Place the carrot, cucumber, and chilies in a mixing bowl and add in the sugar and vinegar mixture. Chill for about 20 minutes before serving. Spicy Lemongrass Chicken: Season the chicken thighs with sea salt and black pepper. Heat a large cast-iron pan over high heat and add 1 Tbsp of peanut oil. Add the chicken and fry both side until golden brown. Turn the heat to medium and mix in the sauce, press down the chicken meat with a spatula, and continue to cook until the sauce thicken and become caramelized. Remove from the heat and let cool slightly before slicing. Sandwich: Lightly toast the baguette and fill with chicken slices with its sauce, pickles, green chili, and assorted herbs. Serve immediately. Wow. This is such a nice combination and your picture is beautiful. Very nicely done!! Your beautiful picture really grabbed my attention on Taste Spotting, and your recipe made me want to try it! Yum! I need to try this sandwich soon, can almost taste it just by looking at those gorgeous pictures! Made this for lunch today and I can see why you're hooked! Great textures and flavours and it's pretty easy. which assorted herbs do you use? @Anonymous: Asian/Thai basil, coriander, and Ngo Gai/Sawtooth. I've had this bookmarked since it was posted and I'm finally going to make it! What type of green chilies did you use, and how big were they? @Stef: It's the same size as serrano or jalapeno.